Features: ADJUSTABLE LENGTH:: Walking two dogs at once is is hard. Let the Mighty Paw Double Dog Leash ease the burden. Our adjustable length dog leash accommodates big dogs, small dogs, or both! With our EZ-glide hardware, the leash adjusts quickly from 16-24 inches a comfortable, individualized fit for your dogs! The leash accommodates dogs from 0-100 pounds. 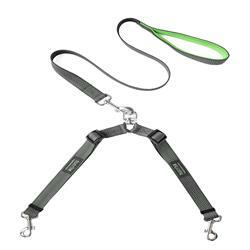 TANGLE FREE: Enjoy the ease of our heavy duty tangle-free swivel leash attachment. You will never have to worry about your dogs getting tangled with Mighty Paw Double Dog Leash. WEATHER-PROOF MATERIAL: As with all Mighty Paw products, the leash is made the highest quality material including weather-proof nylon and durable hardware to ensure its use for years to come. REFLECTIVE STITCHING:To keep you and your dogs safe when the sun goes down, we have added reflective thread stitched along the entire length of the handle and both leashes.